​​​​​​​In this dramatic bathroom by professional design company Detail by Davinia Sutton, some elements like the vanity and tub pop and some, such as the shower fittings and towel rails, recede to the eye. A sense of balance in a design is everything – and that can range from contrasting forms, to contrasting hues or even juxtaposed textures. This bathroom employs all of these options. 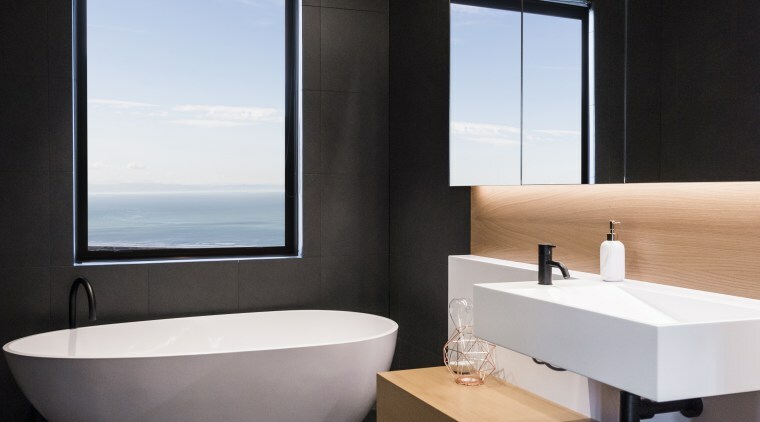 The design brief for the project was to create a bathroom that continued the overall modern approach taken with the home’s architecture, says designer Davinia Sutton. 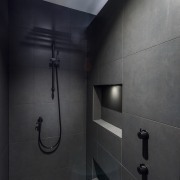 To this end, the owners wanted a bathroom with clean, crisp lines and contemporary forms. 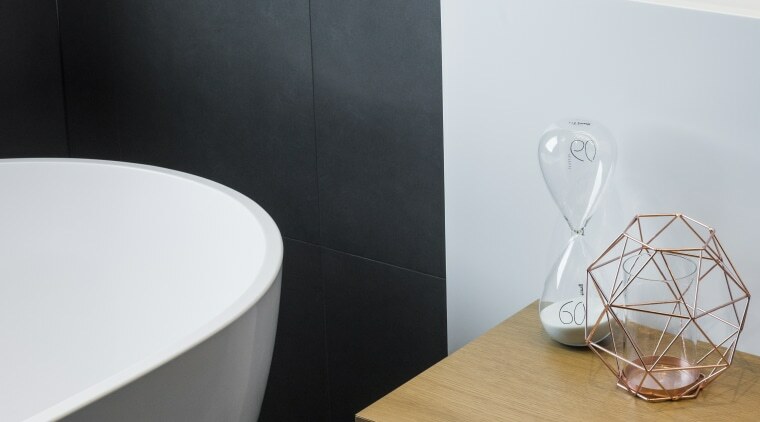 They also wanted the bathroom to reflect the use of modern materials, offer plenty of storage and include a degree of privacy for the shower zone. ​​​​​​​To achieve the effect you want in a space, it’s important to consider things together, not in isolation. In this bathroom by designer Davinia Sutton, the crisp lines of the cantilevered vanity and wall base are offset by the softer lines of the curvaceous tub. “The design makes a bold statement on entry with a large freestanding, engineered stone bath set under the window,” says Sutton. “Adjacent to this, and playing off the fluid lines of the tub ,are the sharp, clean lines of a rectilinear custom vanity and plinth, set off from the back wall. While these forms stand out, the dark tones of the Liquorice wall and floor tiles recede, adding to the effect. And the same tiles also feature in the shower. 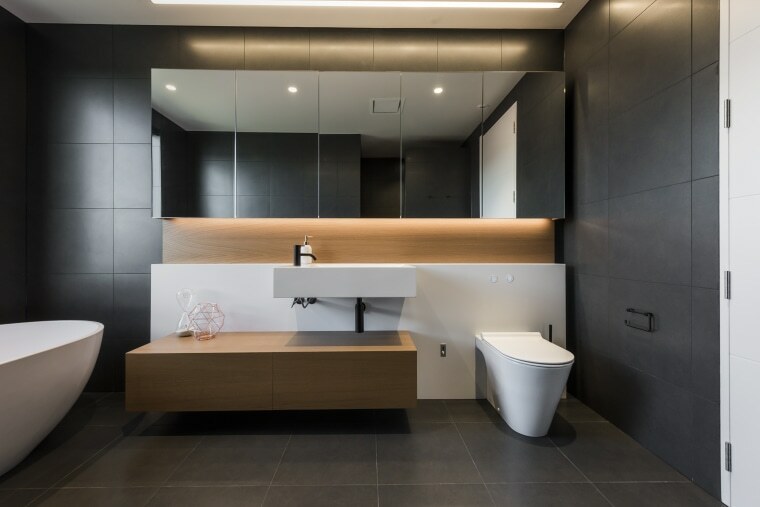 As a result of these material choices, the bathroom’s palette is bold and strong, with the mix of contrasting finishes creating a feel of sharpness and personality. Storage is provided by the mitred box and mirrored wall unit, while the niche between basin and cabinet is ideal for to-hand elements. ​​​​​​​A curving engineered stone tub is juxtaposed with clean-lined engineered American white oak veneer cabinetry in this bathroom design – to mutual dramatic effect. To bring privacy for someone showering, Sutton created a large walk-in dual shower zone in behind a tiled wall. At the same time, the wall-hung toilet is tucked into the opposite corner of the room, which is also hidden from sight at the point of entry.